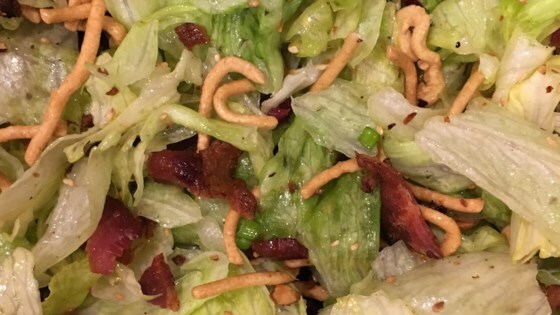 "This is a crispy and crunchy salad with bacon and toasted almonds." In a salad bowl, combine the bacon, lettuce, almonds, sesame seeds, green onions and chow mien noodles; toss and refrigerate. In a glass jar with a tight fitting lid, combine the oil, sugar, vinegar, salt and pepper. Shake well and chill for 1 hour. Before serving, shake dressing and pour over salad; toss and serve. My husband and I LOVE this recipe - great salad! Great for potlucks as it's still good when it's "soggy". This is a wonderful and easy recipe! I've served it a number of time for guests and have received raving reviews and requests for the recipe. I highly recommend trying this out!